The IndieGameStand Store has expanded into a full-on digital distribution service designed to make life (and selling games) a whole lot easier for independent game developers. The IndieGameStand launched a year ago as a twist on the ever-popular "pay what you want" game bundles: Every four days it offers a new indie game for whatever price you want to pay. It's one game at a time, but kind of like the weather in Winnipeg, if you don't like what's up for grabs now, just wait a few days for something else to come along. It's enjoyed considerable success, bringing in more than $215,000 for indie developers and nearly $20,000 for various charities, and proven popular enough that the IGS team decided to roll out a full-time digital storefront. "The idea for the store really came to us after we kept hearing from developers about how easy our backend is to use. Developers can literally set up their game in minutes and get listed in our store the same day they set everything up. We certainly see this as a huge advantage since we don't waste developers' time," IndieGameStand co-founder Mike Gnade explained. "Another thing that separates our store is that it is extremely flexible. Our platform can support a game in alpha or one that just got greenlit by letting the developer easily upload Steam keys which are then automatically distributed to IndieGameStand customers." The IndieGameStand Store won't rely on a "popularity contest" like Steam Greenlight to determine what goes up for sale, but will instead offer a quality platform and tools to all indie developers who want to take advantage of them. He also said that the IGS team wants to support indie games exclusively and hasn't even discussed the possibility of offering more mainstream games. And while the likelihood of huge, Steam-like sales is remote, the IndieGameStand Store allows individual developers to set their own sale dates, which opens up some interesting possibilities. "Theoretically, a bunch of indie game developers could band together and launch their own Steam-style sale without our involvement," Gnade said. "Imagine a bunch of Indie Megabooth developers banding together to offer a sale during PAX. That would be really cool and organic. It's awesome that developers (once they're approved) have the freedom to use our tools however they want. We're excited about that." 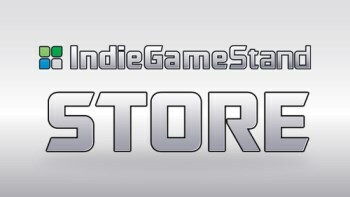 The IndieGameStand Store is live now and currently offers 94 games from 72 different developers. To mark the moment, the IGS team has chosen 14 of its favorite games for inclusion in a launch sale that will run through October 1, including Escape Goat, SpaceChem, Paranautical Activity and Vox, and there's plenty of other good stuff up for grabs too. (The Adventures of Shuggy is quite solid, if you're interested in a recommendation.) If you're looking to blow a few bucks on some quality indie action, this might not be a bad place to start.